Brunch Panic is listed as an Action Adventure game on Nintendo’s website, but those who’ve seen this game know it’s much more a simulation/strategy title, which puts your multi tasking abilities to the test. 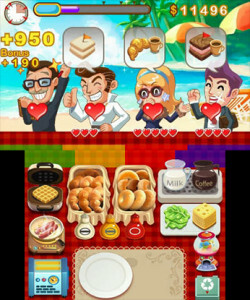 You’ll be challenged with cooking and juggling a wide variety of food items, and trying to serve them in all sorts of interesting (and outright strange) combinations in the fastest way possible. It’s a simple premise that works well on the 3DS, and proves to serve up some accessible fun. 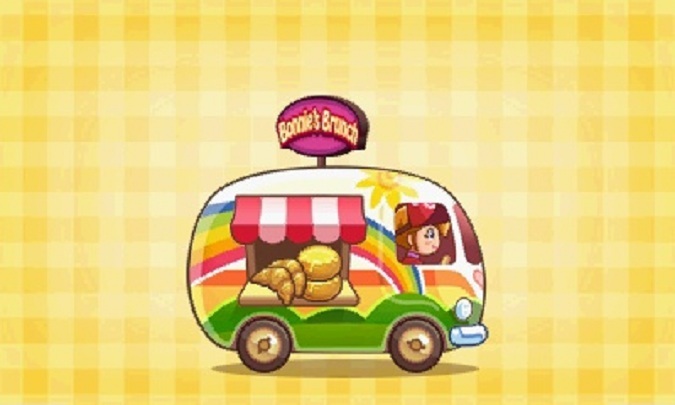 The main character is a young girl named Bonnie, who is traveling the world in her new brunch truck. The initial story doesn’t have much substance, but subsequent comic type cutscenes help give the game some character. 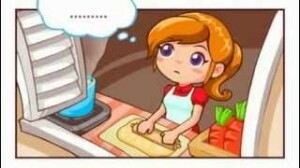 ‘Break Time’ shows Bonnie interacting with different comical customers, and the short scenes are cute and amusing. The narrative is displayed in English, but all voices are in Japanese. As someone who has played a lot of imports, I thought it was kinda cool. For those who haven’t though, I could see this being an annoyance. You can turn individual voices on and off though, which is a pretty cool option. But even if you hate the lack of complete localization, the story isn’t really that important. It serves its purpose in setting up the gameplay, and moving you to and from various colorful locations. Starting with very simple tasks (how quickly can you put a bagel on a plate?) basic duties will quickly give way to more complex fare as new food and drink are introduced. While items like bagels or croissants can quickly be grabbed and plated, cooking an egg or making a waffle take time. The necessity to wait adds a degree of tension in later levels, as orders pile up and customers start to get impatient. There are only a handful customers in the game, that repeat frequently, but each have own unique ordering habits and quirks. From gramma who is s-l-o-w to decide, to the actress that will change her order on a whim, the characters are fun and well developed within the confines of the game’s limited narrative. Occasional ‘Rush Stages’ switch things up from multiple customers ordering at once to lining up singe file instead, giving you a limited amount of time to get as many orders out as possible. The waiting time for food preparation is greatly reduced during these stages, making you focus solely on quick and accurate delivery, and not juggling multiple orders at once. It gives the game a bit of variety, and I welcomed the change. The earn up to three stars approached is used here, as it is in many games, including Circle’s last eShop game Wakedas. This is always good for replay, and pretty much guarantees that a handful of levels will be revisited at least a couple of times. On early levels you’ll get three stars the first time through, but later will be tough. While trying to max your stars during these , I caution you not to be too aggressive with your stylus. Even though the game is perfectly suited to stylus control, with tapping and sliding, there is so much of it that your screen might get scratched up in your efforts to serve as quick as can be. Virtual tips aren’t worth cost of a scratchy screen, so don’t get too carried away. There are a few things I’m not crazy about in Brunch Panic. For one, if you make a mistake the entire order needs to be thrown away. A ham, egg, and cheese on French toast might be correct, but put coffee with it instead of milk, and you can’t just chuck out the drink … say goodbye to the whole meal. The pacing could be a bit better too, with the early sections being too easy, but mid areas introducing new things without let up. Lastly, while the games visuals are crisp and colorful, there is no attempt to incorporate 3D. Much like Circle’s last 3DS game, this is a 2D only affair. In spite of this omission (and the aforementioned concerns) the game still manages to impress. Brunch Panic isn’t a very long game, but it’s charming, and priced right at $3.99. For fun in short bursts, Brunch Panic delivers.